The tiny science of nanotechnology could give a big boost to cancer patients undergoing tumour treatments. BrachySil, by biotech firm pSivida, is a silicon-based nanoscale system that takes drugs direct to the tumour site. Silicon's structure carries an electrical current, is porous and adaptable. This means the right amount of drug can be released when needed. Two patients at Singapore General Hospital have started testing it, with 10 more due to take part within weeks. The new nano drug-delivery system is based on the material known as BioSilicon. Its developers expect it to be part of the next generation of brachytherapy - cancer-zapping treatment given at a very short distance from the tumour. BioSilicon material is said to be cheap to make, biodegradable, and safe to administer. "This is advanced materials work," Stephen Lake, QinetiQ investment director, told BBC News Online. QinetiQ, Europe's largest science and technology organisation, is an investor partner in pSivida. He described the new material as a "true platform technology" because of its adaptability and broad applications. "Silicon, when reduced to the nanoscale (less than one thousand millionth of a metre) becomes biodegradable and dissolves into the body as silicic acid." The acid is harmless and is the natural form of silicon, usually absorbed from food. Silicon can also be very porous at that tiny scale. The pores are typically about 10 atoms across and can be loaded with drugs, peptides, genes, proteins, radionuclides and other therapeutics or vaccines. The structure of the pores also means they can be adapted easily. "If you put a drug into a tumour with BioSilicon there are no mice deaths in the lab," explained Mr Lake. "If you take the same amount of drug and inject it straight into the tumour, there are 100% mice deaths. "So, this shows that BioSilicon structure is the key to enabling effective delivery." Time-release drugs are not new. 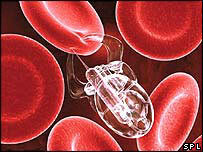 But, unlike conventional drug delivery systems based on polymers, silicon carries an electrical current. This means the rate at which BioSilicon breaks down can be directed. BrachySil is made by concentrating phosphorus in the silicon and putting it in a reactor. This creates the radioactive isotope phosphorus-32, which has a long half-life of 14 days, much longer than other radionuclides currently used, which often break down after just 60 hours. The nanotechnology system has a wide range of applications across drug and vaccine delivery, diagnostics and tissue engineering, says Mr Lake. Responsive wellness monitors could be created, or biodegradable orthopaedic pins. So far, lab tests have been very successful, and the next phase of human testing in Singapore on primary liver tumour patients is expected to yield results by September or October 2004. But because BrachySil is classed as a device, it will be regulated as such and could be on the market by 2006. 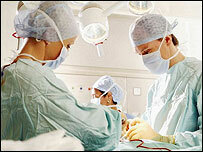 It is hoped that the product could then be used on other types of tumours, like brain and pancreatic growths. "Because BioSilicon is a semi-conductor, we can move more towards smart devices which can sense and monitor activities then release its drugs," said Mr Lake. "In the long term - five to 10 years - there are a lot of very exciting opportunities for small devices." Singapore has one of the highest rates of liver cancer in the world.